Assemblyman Burke isn't moving the legislation forward in Albany. 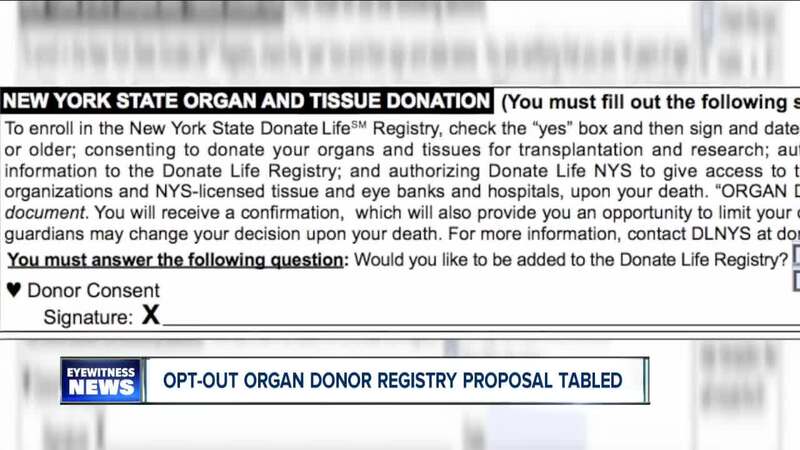 BUFFALO, N.Y. (WKBW) —Assemblyman Pat Burke is tabling legislation that would have automatically enrolled New York residents 18 years of age or older as organ donors unless they chose to opt-out of the registry. “I'm not going to push leg that my constituents aren't comfortable with. I am going to engage with them because it's about saving people's lives,” said Burke. Burke said he received a number of concerns via social media over the weekend. The legislation would have created a space on the driver's license applications for applicants to opt-out of the New York State organ and tissue donor registry. Current wording on the application allows applicants to opt-in instead. It also allows you to skip the question. Burke said the goal of his proposal was to increase the number of donors statewide. “Currently, there are people on a wait list. We need to fix that,” he said. Burke may still introduce the legislation at some point. But, he said he wants the public support first.